What does it mean? The fellowship of suffering? I thought fellowship was a coming together of like minds. Enjoying the company of common ground. A friendly association with someone of like interests. But suffering? I’ve not really bought into that. Honestly. The suffering that I’ve experienced probably isn’t true suffering. Compared to what I see and know of others. My life is mild. Oh sure. I’ve had my fair share of ups and downs. Fears. Loss. Discouragement. Trying times. Typical life difficulties. But I’ve never hung on a cross and died. For myself or for others. I’ve never been spat on. I’ve never been stripped naked and forced to carry a heavy cross on my raw beaten back. I’ve never worn a crown of thorns. I’ve never received a life altering diagnosis. I’ve never been handcuffed and stood before a judge. I’ve never been served papers. I’ve never been beaten. I’ve never lost everything. Oh. I’ve lost. I’ve lost family members. I’ve lost jobs. I’ve lost friends. So what do I know of suffering? I’ve never been put on trial for crimes I didn’t commit. And then sentenced to death. My mother never wept for my cruel death. Oh. I’ve been betrayed by those I thought I could trust. I’ve been handed over to others who carried out their own plans for me. I’ve had cruel words spoken to my face. I’ve been bullied. But have I really suffered? Is it suffering when someone publicly outs me for words spoken in private? When I’ve felt safe to express my opinion but then publicly called on the carpet for it? 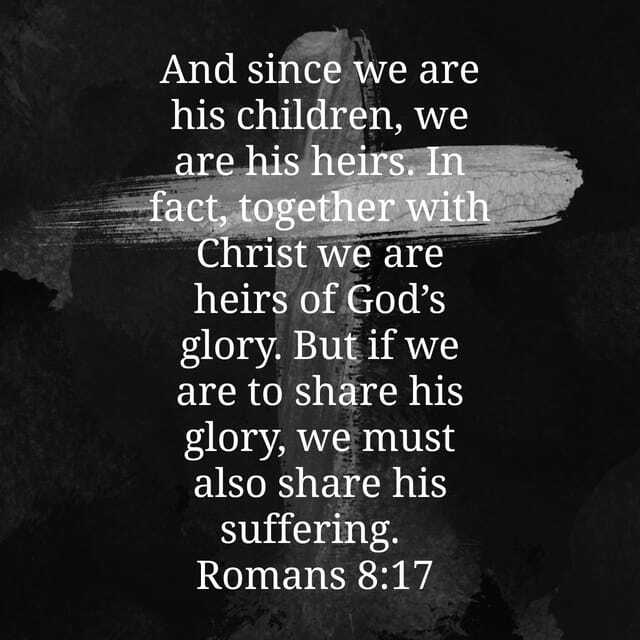 Where is the glory in suffering? Where is the fellowship? Is my suffering a product of my own doing? Or of my own undoing? Elisabeth Elliott says that suffering is never for nothing. There are hard lessons to learn during the time of suffering. She says that suffering is having what you don’t want or wanting what you don’t have. I have to wonder if I’ve caused some of my own suffering. Am I my own thorn in my side? Do I blame God and others when I need to remove the mote from my own eye? Is my suffering another name for the thorn in the side I’ve been given? And can I get past the bitterness in order to use that thorn as a source of ministry to others just like me? Will I look back on these days in awe and wonder that I survived without a scratch and thank my heavenly Father that I didn’t really suffer? Or will I realize that what I thought was suffering was not even a drop in the bucket of misery? Only time will tell. What if my suffering is still in front of me. What if my current state of suffering really isn’t suffering at all. I have to ask myself the question. What does my suffering produce? Does it lead to anger and bitterness? Lashing out at others about the unfairness of God? Trying to punish God for treating me so poorly? How could a loving God allow this? Or do I surrender in knowing that my God is carrying me through the depths of pain and loss and uncertainty? Do I find joy in a closer relationship with a God who loves me even when unexpected twists and turns come in life? Do I allow myself to be wrapped in the sweet arms of Jesus and just be held? It’s in the surrender and acceptance of my situation that leads me to fellowship. Once all the thought of getting even or standing my ground passes, the knowing of God’s love gives the sweet peace that nothing else matters. The pain. The loss. The heartache. The hurt. The healing. The new normal. The surrender of my will to a loving God brings a sweet fellowship that surpasses everything else. The trust that God will be with me every step of the way gives a calming peace to my soul. God knew David. He knew the good. the bad. the ugly. God called David a man after his own heart. Even when David sinned. And he sinned badly. But what sin is good? But oh. David stole someone else’s wife. She became pregnant. So he had the husband killed. Lust. Adultery. Premeditated murder. And after all that, God still said that David was a man after God’s own heart. And God was right. He always is. David is the only person who God says is a man after his own heart. For God knew that David would always do what God wanted him to do. Read it for yourself. 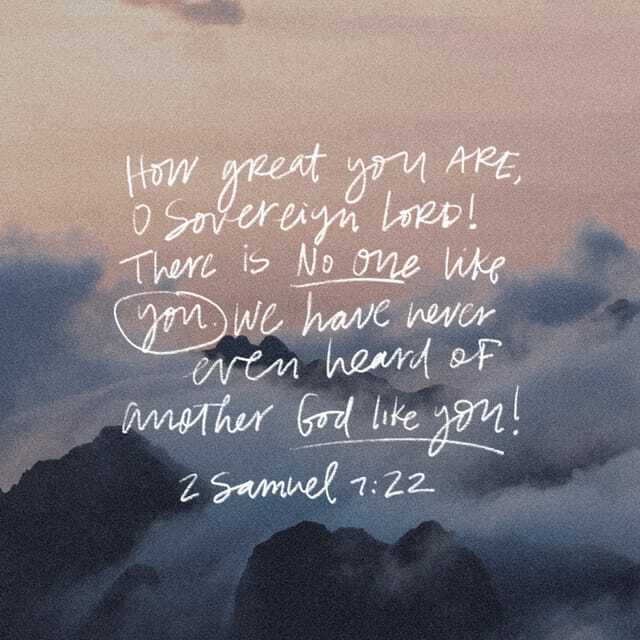 To be the only one God mentions in that way says something. Oh. God knows everything. So he knows. He knows the intentions of your heart. Even before you do. God knows if you will do everything he wants you to do. I have to ask myself. Do I have a heart that runs after God? Do I seek him above all else? Where do my interests lie? 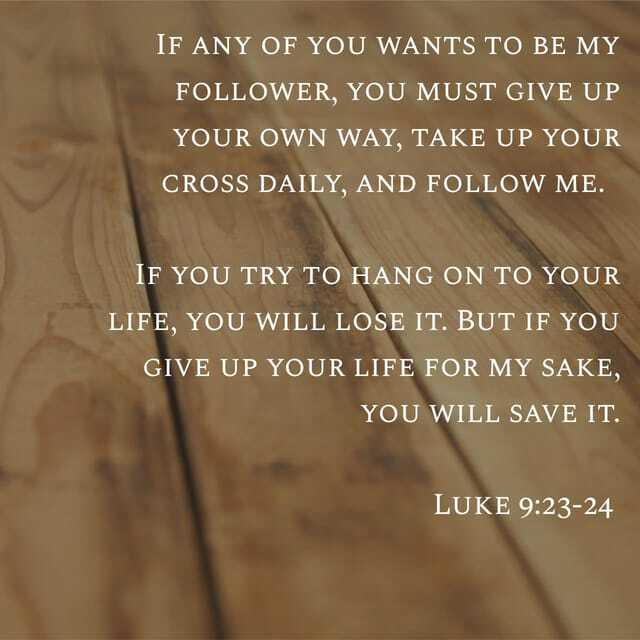 Will I do everything God wants me to? Is it even possible? I mean. I want to. But. What are the choices here? Oh sure. David was human. He messed up multiple times. He did things out of turn. But every time he found himself outside of God’s graces, he admitted it and ran back to God. He was God’s and God was his. No matter what. David served only one God. Oh. David had his faults. But he had strengths that continued to draw him to God. He was loyal. He loved fiercely. He was humble. He was honest. He had inner strength. He took risks. He served only one God. He spent time alone with God. There is something for us to consider. When we fail. When we disobey God. When our sins are made known to us. Who do we run to? What god do we turn to? Do we automatically run back to the God of the universe? Or do we run to the god of the credit card? Or the god of the bottle? Or the god of the trashy novels? Or whatever that fake god is we run to to soothe our hurting hearts. And does it work? That running to false gods? Does it take the pain away? Does it solve the problem? Does it lessen the anxiety? Does it pay the debt? Does it heal the relationship? Does it remove the sadness and unloved feelings? If you’re not running after God’s own heart, then whose heart are you running after? Your own? Most likely. Who else’s heart would you turn to? Where could I run to? Even then. There is a choice to make. We can always choose to run back to God even after we’ve run far from him. Even when we’ve committed those sins that break us. Even when we’ve hurt others and ourselves. God continues to love us and beckon us back. We can choose to have a heart for God. We can choose to run back to him. 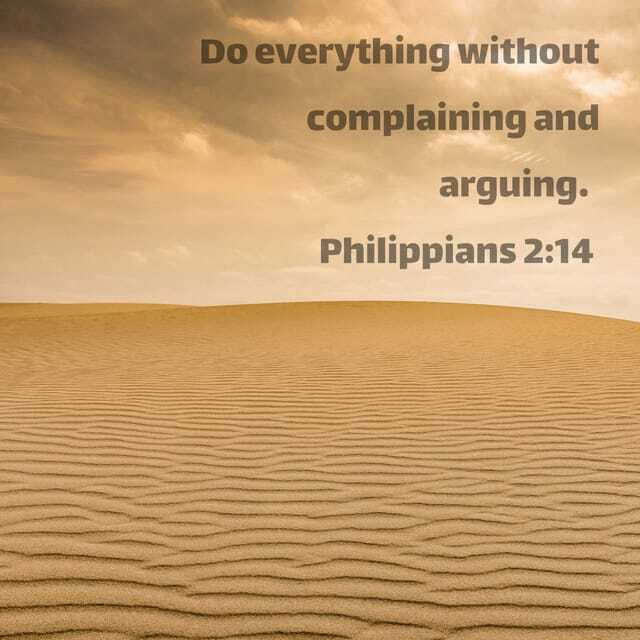 We can choose to do everything God asks us to do. We can. That new thing coming your way. Oh. It may be a miracle of God. Do you accept it? Do you believe it? Will you trust it? Amid all the uncertainty and unfamiliarity and newness. Will you allow God to work in the ways that he sees best? I say let’s let God do that new thing. Even when its hard. Because new isn’t always easy. It’s in the letting go and allowing God to work that makes the newness work. Newness means giving up the old for something different. Something uncomfortable. Something that teaches new lessons. And that can open new doors if we will just walk through them. I’m preaching to myself here. Newness for me is now eight months in the making. It still feels uncomfortable. There are still days I want to run in the opposite direction. But God continues to lead me down the new path. I sometimes wonder why he brings me to a new thing that is really hard. and then leaves me there. I have to admit. There are rewards and blessings in this new place. I can’t deny those. But there is also discomfort. Anxiety. Uncertainty. Doubt. Doubt in myself. But I know I must continue to trust God. and follow his lead. For he is doing a new thing. If I’m in charge of the newness, well. Everything is ok. I’m all in. If someone else is calling the shots, it’s a different story. I have to choose to cooperate. Oh. Newness is hard. 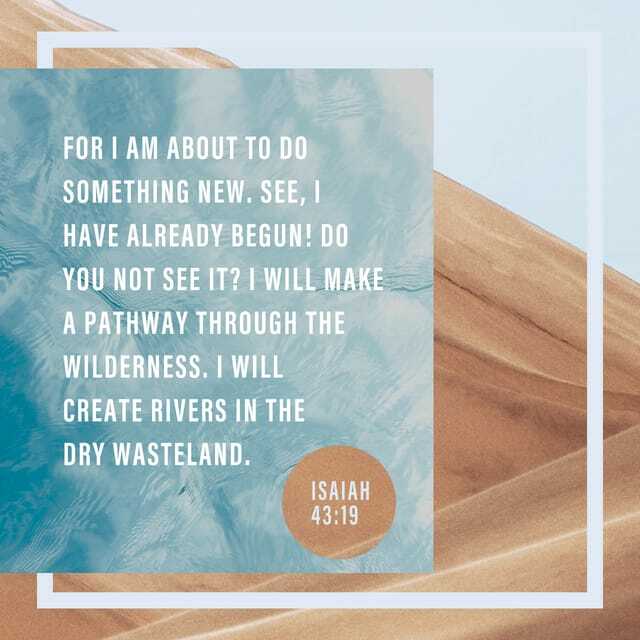 Isaiah reminded the Israelites of all the newness God had provided for them for over 400 years. He delivered them from Egypt. He performed miracle after miracle just to provide for them. He parted the Red Sea. He provided manna for 40 years so they could eat every day. He kept their clothes and shoes from wearing out for 40 years. He parted the Jordan River. He fought their battles. He won their battles. As long as as they were obeying him. But the Israelites still doubted God. They still turned their backs on him. They forgot the newness he gave them. And that was when they lost the battles with their enemies. They became slaves once again. And when they had had enough of being beaten up by their enemies, they would crawl back to God and ask for forgiveness. And every time. Every time, God would pick them up. Dust them off. And forgive them. He would welcome them back. And start the newness all over again. How often is the newness I face a result of my disobedience to God? How often is it a result of God stretching me and growing me into a deeper relationship with him? Step aside fear and let God move. Step aside tradition and let new beginnings take shape. Step aside trouble and let healing and peace make an appearance. Step aside doubt and make way for faith. Step aside human and allow the host of heavens armies to fight for you. Newness. Anticipation. Fear of the unknown. Excitement. Let’s do this. It started out so innocent. Or so it seems. They want their child to go to an elite college. So they find ways to beat the system. They find ways to bump kids who have earned their way into that school. Bump them off the list by paying for a slot for their own trust fund child. Forging college entrance exams. Posing for fake sports photos. Slipping money under the table. For what? We think we’re above the law. At least, we hope we’re always one step ahead of the law. More than anything, we hope we won’t get caught by the law. I know someone who is quick to lose his temper. He says words others hope he later regrets. He speaks out of turn. He has a high opinion of himself. He walked out of work and didn’t return for a week. No word on when he’s coming back. Just walked out. Then walked back into work the next week as if nothing had happened. Oh. He did it more than once. But on the third try, it backfired. He is no longer employed. He pulled the same punch one too many times. Now he is facing the consequences. Shame. Regret. Remorse. Embarrassment. What is it that causes a person to be unkind or untruthful? What is it that causes someone to bully or hurt others? Why can’t we be good? Are we born that way? Are we born to naturally be selfish and hurtful? Can we change? I got her text. She was asking for personal information about a former coworker. Information I didn’t know and wouldn’t share if I did. She was scheming to find out the scoop on everyone she worked with. Gossip is the name of her game. And I decided I wasn’t playing. What is it that causes people to naturally turn toward pleasing themselves? What causes someone to want to do wrong? Are we doomed to be this way? Are our souls totally corrupt with no chance for redemption? Oh. We are born with the desire to please ourselves. From day one, we are bent on getting our way. That one bite of fruit by Adam and Eve turned our hearts away from God and onto ourselves. Their disobedience caused a world of hurt for everyone who came after them. And boy, have we continued down a path of wrongdoing. But that one bite doesn’t have to send us to hell. We have a way paved to heaven for us. We have a path that is narrow but it is open for all. And on that path, our sins are washed away. And that desire to sin. That desire to have the world revolve around us can be removed. 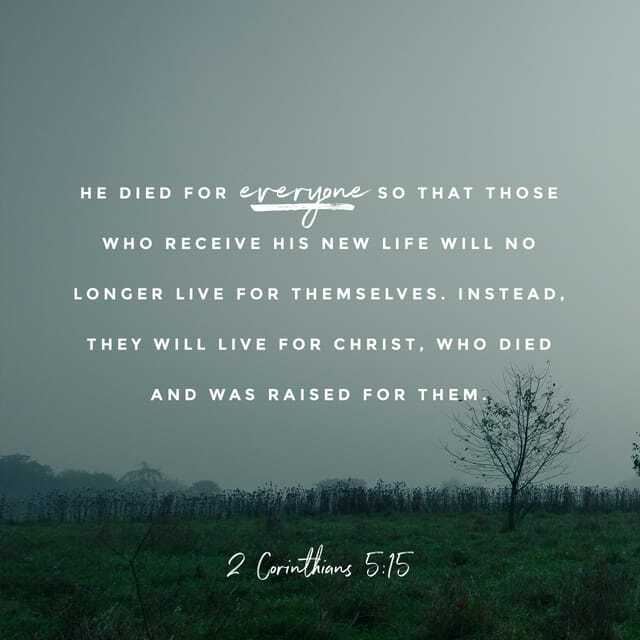 If only we choose life in Christ. If only we repent and ask forgiveness of our sins. Oh. It’s not a one man fight. It’s not a fight you can win on your own. It’s a fight fit for a king. It’s a godly fight. Really. A fight for your life. Your eternal life. And it’s a fight that has already been won. We can claim the victory in four simple steps. Oh. When we confess our sins, we don’t have to name each one. Believe me. There isn’t enough time. And God already knows them anyway. He’s just waiting for us to come clean and repent. Then he erases those sins away. As if they never happened. Thank heaven for God Almighty. Two churches stand poised to make history. A history of faith and obedience. Or a history of fear and rejection. Oh. That may sound harsh. But hear me out. Both churches are in the midst of change. Both churches have been praying for a miracle. Both churches need a miracle. Just not the same miracle. But sometimes God’s miracles aren’t what we expect. Sometimes someone else’s miracle is also our miracle wrapped all in the same package. Just with different gifts inside. One church has a beautiful property. They can no longer afford it. Upkeep has stalled. Ministries have been underfunded. The bank has come calling. They face an uncertain future. Time is running short. They need a miracle. The other church has sold their property. When God said move, they sold their facility and began a search. Even when they had no place to move. They’ve been looking for a new location. Nothing fits the bill or the wallet. Time is running short. They need a miracle. I know these churches. I love both churches. I’m part of one now and was part of the other in the past. Both churches have great people who love God. Both churches are filled with people who want to obey God. Oh. Yes. They’ve each been praying for a miracle. They just didn’t know what that miracle would look like. And now. God has placed a miracle in front of us. All we have to do is reach out and accept it. Oh. It sounds so simple. And it is. Obedience is a simple act of faith. When we pray for a miracle, it’s God’s miracle to perform as he sees fit. We don’t design our own miracles. We need to step back and let God do what only God can do. And he’s doing it. God has opened the door for both churches to come together in the one location. Sounds so simple. But it requires change. For everyone. We like to think we like change. But really. Change is hard. Change demands obedience. Change requires…well….change. For everyone. Everyone will find a level of discomfort as they adjust to the newness required of them. Bold steps of faith will be needed. When God walled off the Jordan River for the Israelites, all they had to do was walk across. If they hadn’t walked across, they wouldn’t have reached the promised land. They accepted the miracle set before them. The first church has what the other needs. The second church has what the first one needs. But that’s beside the point. Its what we have together that counts. Together we can build a strong church that reaches a neighborhood. A city. A county. Together we can work toward increasing God’s kingdom in our corner of the world. Gideon needed a miracle from God to defeat the Midianites. In the process of transforming the Israelite army, God told him to release all but 300 of his men. But God let him know that they would win the war. He also gave Gideon a glimpse of that victory as he slipped through the enemy territory. He overheard words spoken by the enemy that confirmed the miracle God said he would perform. And so Gideon led his army to victory. In spite of the odds. They won as God said they would. They didn’t let fear of the unknown hold them back. We may not know what the miracle we’re praying for will look like. We haven’t been given a glimpse of the future victory. We need to open our hearts to the miracle when God hands it to us. Because it is a miracle. It is an answer to prayer. The two churches have much in common. Both are filled with Christ followers looking to obey God. At the end of the day, both want the same thing. The common ground in doing this work of God together as a larger group is just a taste of heaven. New lifelong friendships. Outreach to the lost. New ministry opportunities. Missions trips. Working together as one body. Together we can achieve what each church can’t do separately. We are better together. I’ve never really observed Lent. I’m not Catholic. I don’t have to. Right? I’ve never given up something that meant a lot to me for 40 days. Well. I have. I’ve done fasts and cleanses. I’ve gone without chocolate and sweets. Sometimes for longer than 40 days. But that doesn’t mean I was observing Lent. I’ve never had a cross drawn on my forehead. I’ve never displayed my faith with ashes. Not even for a day. I’ve read of one who draws a cross in ink on her wrist each day. It serves as a personal reminder of who she is. Whose she is. Of the death someone else died for her. But it’s a temporary reminder she places on her wrist. Each day. It’s not a permanent tattoo. She can wash it off and forget about it. If she chooses. It’s the same with the ashes. They’re a temporary reminder of a permanent sacrifice given by someone else. Once the ashes are wiped off, no one can see the display of sacrifice. It’s easy to forget. I’ve taken to memorization. Scripture memorization for Lent. It’s a humble act. A laying down of my time. A sacrificial learning of God’s redemptive plan. 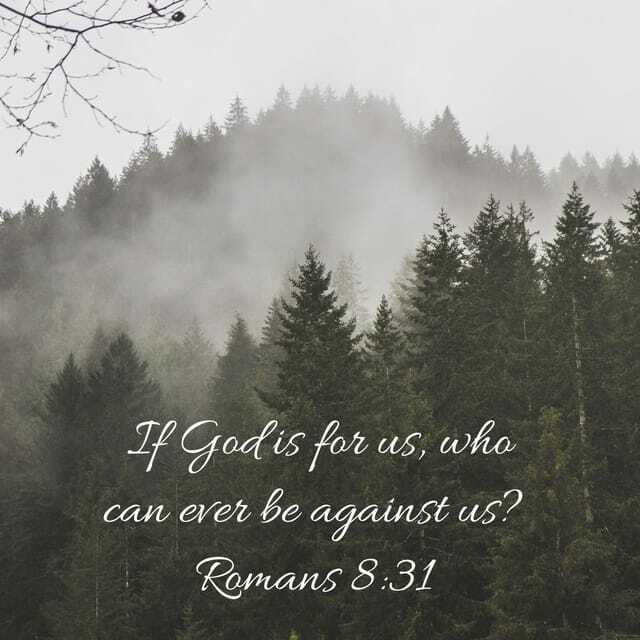 Romans 8. 39 verses. 40 days. Planting the seed of God’s word deep in my heart. I’m excited to see the seeds grow and blossom. But is it truly a sacrifice? To memorize Scripture? Shouldn’t it be a continual process rather than a 40 day sacrifice? My prayer is that this remembrance of the holy inspired words will replace other words and thoughts in my mind and heart. That God’s word will uproot negativity with positive thoughts. That it will surrender any envy of others with praise and respect. That it will dig out any root of bitterness that has burrowed its way into my heart. Oh Lord. Work your word into the crevices of my heart. Into the nooks and crannies of my soul. Into those hidden places that only you can fill. Cover me with your presence. From dust I was formed and to dust I will return. Until that day, make your word come alive in me. Oh. It isn’t easy. The learning of words in a specific order to form a complete thought about God’s love and redemption. It’s reading the words over and over. It’s placing them in front of me at all hours of the day. Trying to cement the words in my heart as an act of obedience to the One who gave his Son for me. I’ve invited others to join me on this journey. Some say yes. Others are unsure. Perhaps some will choose to fall away from the challenge. There will be those who cross the finish line. To be honest. I’m struggling. It’s taking more time and work than I want. But I know the end result will be worth the struggle. So I continue down the path of hiding these words in my heart. It’s a temporary struggle that will result in a lifetime of remembrance. I don’t mean to call attention to my act of learning. I’m not looking for praise or reward. This is an act of burning the dried embers of my heart into ashes of praise and thankfulness for my Savior’s sacrifice. It’s the least I can do. I have died to myself. Daily. I do live for eternity. Daily. I’m covered with Lent. I remember the day well. It started out the same as most work days. But before that work day was over, my work was over. I saw the email. It was from HR. Can you come to my office? As I walked past my boss’s desk, I noticed she wasn’t there. Red flags sprang up all around me. I knew what I didn’t want to know. My job was over. I sat in that office hearing the news. I’m sorry. Your job has been eliminated. You don’t have the skill set that we’re looking for. You’ve done nothing wrong. But we no longer want or need you. Crushing. Heartbreaking. Humiliating. I packed up my belongings and walked out the front door. Never to return. At my age I wondered. Would I ever work again? I’ve learned a lot about myself since that day. I’ve learned a lot more about God. I’ve learned that he never leaves me. I’ve learned that he loves me so much. whether I’m employed or not. I’ve learned that he will take care of me. He’ll provide for all of my needs. I already knew all those things about God. But he proved himself time and again. The thing is. I did get another job. Five months later. And this job has kept me close to God. This is not the job I would have chosen for myself. But it’s the job God has chosen for me. So I go every day. I do the job. Oh. I pray a lot. I need God to help me do this job he’s chosen for me. And he is. He always shows up to work on time. He strengthens me. 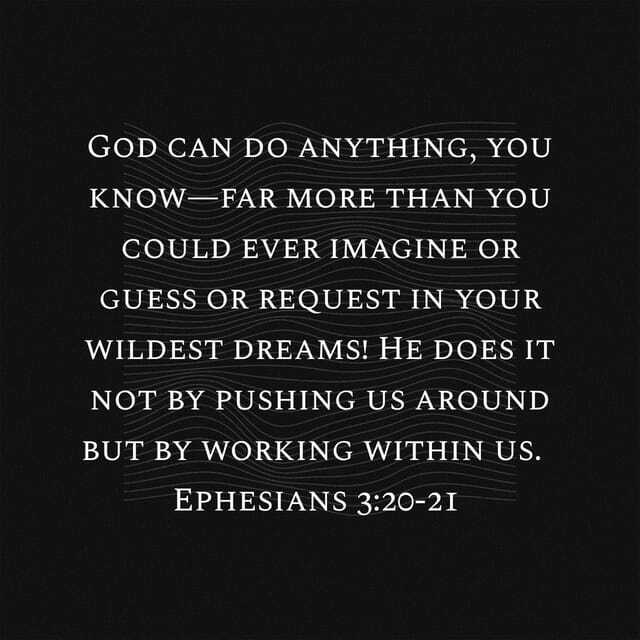 He equips me to do the work. He calms my fears. New ones have come after me. They ask the same haunting questions I once asked. Can I do this? Will I be able to learn all the complicated steps? I assure them that yes. Yes they will. I’ve struggled with this job. I’ve wanted to run the other way and never look back. But I hold on. For one reason only. God has placed me here and God will release me in his time. Through this past year, I’ve learned to trust God in all things. He has said he would empower me. And he has. He has said I am equipped for the job. And I’ve found that I am. He has shown his love to me in so many ways I cannot comprehend. He has proven so faithful. His promises are true. I’ve learned that God is for me. Not against me. I’ve learned that he fights for me. He is my stronghold. He never lets go of me. He is the Almighty God in my little corner of the universe. I saw the text early that morning. Someone is out sick today. I need you to fill in for her. Immediately I was annoyed. My work day was all planned. I didn’t want to disrupt my plans. I had lots to do and little time. Now I would have less time. I had a bad attitude before I ever left the house. I prayed on the drive to work that God would change my attitude. If I needed help, I would hope someone would step up for me. Why am I not willing to do the same? Later after the work was distributed, I realized I wouldn’t have to fill in for my sick coworker. Then I was flooded with relief. And guilt. I had just gotten a reprieve and I had trouble accepting it. Now I wanted to help. But I couldn’t. What was wrong with me? I now had the day ahead of me. My schedule was intact. Why wasn’t I happy with that? It’s what I wanted. I have to remind myself that I am working for God. And no one else. I need to focus on pleasing him. No one else. I received news that I didn’t want to hear. More attitude adjustment needed. Where he sends, I go. When he says stay, I stay. When he says trust, I surrender. I overheard the conversation. He was asked to do something. He answered honestly. I don’t want to, but I will. Perhaps I should take his cue. I hear two or three of them laughing and talking. Sounds like a good time. A sorority I wasn’t invited to join. Disappointed. Annoyed. Jealous. But why? Why do I care if I’m not included? They could be up to no good. They could be plotting revenge. Or they could actually be working. Why do I concern myself with issues that aren’t mine? I read about the Israelites. God had just delivered them from slavery in Egypt. He parted the waters of the Red Sea and walked them across dry land to the other side. He killed those pursuing them. Three days into their journey they start complaining. How soon they forgot the miracles God had just performed to save their lives. To give them freedom. To take them to their promised home. They continued to grumble and complain. They said they would prefer to go back to Egypt and be slaves again. Later, they said they would prefer to die in the desert than be killed by their unknown enemies. So that’s what happened. God gave them what they wanted. He allowed them to die in the desert. Never seeing his promise fulfilled. Why? Because they were a stubborn, grumbling nation. They took their eyes off of God and thought more of themselves. They failed to focus on his promises. They sought their own remedy. So God left them to themselves. I must remember to keep my eyes on God. I must remember to listen to Him. Read his word. Trust him. Obey him. His promises are true. He doesn’t lie. I really do want to please God. I want to be more like him. Every day. Why is it so hard? Why do I feel I’m always falling short? My attitude stinks. My actions speak louder than my words. I complain. I compare. I judge. I want to do right. I want to be a good example to those around me. I want to be a better person. But I can’t do it on my own. I’m such a failure on my own. I need God’s help. Please God, be merciful to me a sinner. Actively dying. It’s a strange idea. And a stranger act. Have you seen it, though? Someone who is actively dying? It’s a deathbed scene. Not the place most people choose to be. Internally, the person is reliving their life. They are working through unresolved issues and situations that happened in their life. Oh. It may not be pretty. It may end tragically. But people need to resolve issues before they pass on. Some passings are peaceful. Others are fraught with anxiety and rehashing of events past. Some who are actively dying ask for loved ones. They want to see the person one last time. Perhaps to hold their hand. Look them in the eye. Say some final words. Then they’re free to leave this earth. Their final business is finished. Others go in peace. They’ve worked through their unresolved issues long before their last breath. They’ve forgiven. Mended fences. Said their piece. Let bygones be bygones. They’re free to go. We’re all actively dying from the moment we’re born. Oh. We’ve just begun to live. We haven’t hit our peak. But we’re dying. We can’t count our toes. We can’t even walk. But we’re dying. You see. We’re born to die. It’s that simple. It doesn’t matter what happens in life. It doesn’t matter what we do. It doesn’t matter how long we live. We will die. I find the older I get, the more I’m actively dying. I have to die to myself everyday. Every. Day. I have to die to my wants. My dreams. My goals. I have to place myself and everything about me in God’s hands every day. I die to myself. It isn’t my way that I want. It’s God’s way. I have to make peace with my mistakes. My attitudes. My words that should not have been spoken. In my actively dying state, I need to forgive those who have hurt me. I need to mend fences where there are tears. I must work on resolving issues that still cause me to lose my breath. The dying to myself is sometimes painful. The letting go of my will. The tearing down of my gods. The softening of my stubborn ways. Oh. The pain is real. When a rose bush is pruned, part of the branch is cut off. Left useless so the stronger, fuller branches can grow and produce more fruit. The same goes with the pruning of my stubborn soul. I must allow God to cut off my dead and useless branches. Then he can prune the branches that are bearing fruit to produce even more. I must be willing. I remember the song. I remember the singer. He had a big voice. He sang big. He was a big man, yet he sang about how small he was. Compared to God. Compared to God, he was a heartbeat. He was a soul. He was loved. He was part of God’s plan. But compared to God, what was he? The man just won his sixth Super Bowl. He won his first Super Bowl in his second season of play. He’s played in eleven Super Bowl games. And some think he should have already retired. But he keeps playing. He says he isn’t done yet. Some people think he’s a god. Some people are tired of him. 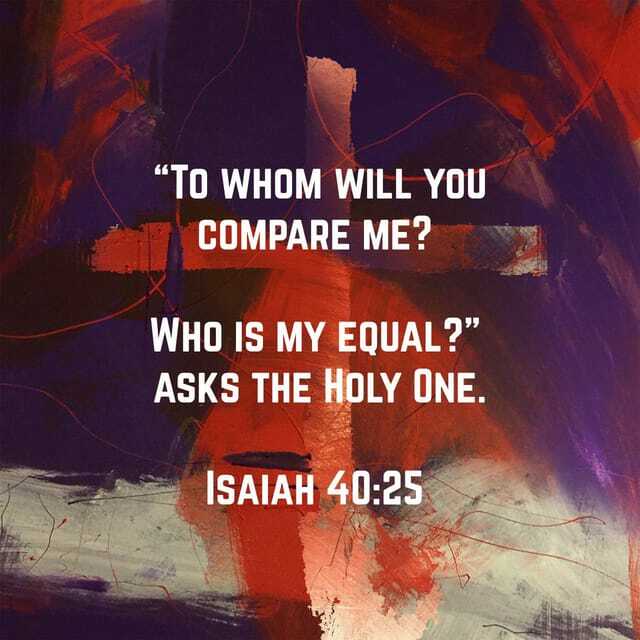 But compared to God, what is he? A billionaire is the President of the United States. Another billionaire is talking about challenging him. Billionaires. Some people think they’re gods. Sometimes they think they are, too. There are over two thousand billionaires in the world today. They’re richer than ever. They can buy anything. Do anything. Live anywhere. Travel anywhere. Have anything their hearts desire. But compared to God, what are they? Only God has held the ocean in his hands. Only God has measured the heavens with his fingers. Only God knows the number of hairs on my head. No one but God knows the number of times this heart of mine will beat. No one but God knows the weight of the earth. 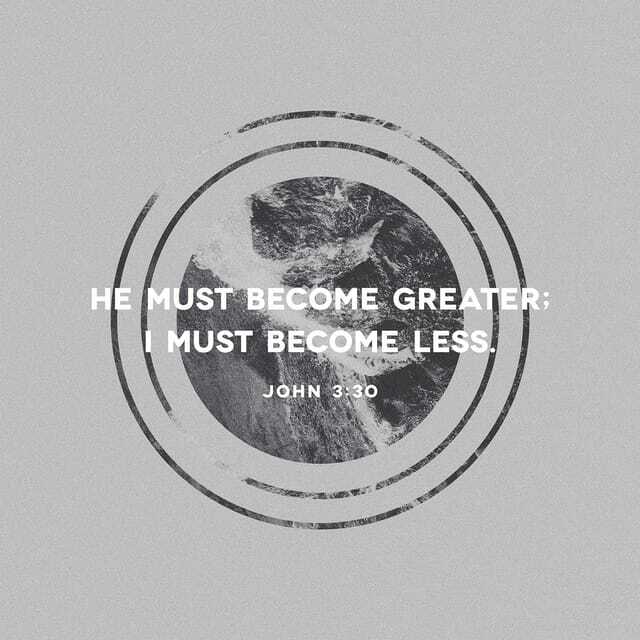 He gives power to the weak and strength to the powerless. He doesn’t need advice or instruction. He heals the brokenhearted and bandages their wounds. He counts the stars and calls them all by name. Some use his name as a swear word. They take his name in vain without a single thought to what they’re saying. Little do they know that God has many names. Sure. God is small enough to live within my heart. But belittling him and who he is by using his name in vain makes the speaker even smaller. Oh. People do it all the time without a second thought. He feeds the birds. He cares for the flowers. Won’t he do the same for me? He saw me and knew me when I was in my mother’s womb. He searches every heart. He knows every thought. He sees every troubles. He sends the snow like white wool. He scatters frost upon the ground like ashes. He hurls the hail like stone. He sends his winds, and the ice thaws. Can he be compared to an idol formed in a mold, overlaid with gold and weighed down with silver chains? The Lord your God is the God of gods and Lord of lords. He is the great God, the mighty and awesome God, who shows no partiality and cannot be bribed. No one can measure his greatness. May his name be praised.